Against the backdrop of the recent scandal, started by the Ministry of Foreign Affairs of Ukraine concerning the Deutsche Welle that called the fighting in Donbass a civil war in one of its articles, it’s high time to recall the severe cruelty which Kiev обошелся со своими Russian female citizens. Tsargrad decided to tell the stories of only three women, three out of hundreds that hide in the rooms of a Donetsk dormitory, out of thousands of stories in Donbass on both sides of the line of contact, and buried in its soil, crying to Heaven. And this all is because Elena refused to put up with “Ukrainian winter” that replaced the “Russian spring”. Instead, she founded a volunteer movement “Vozrozhdenie” (revival), she even managed to register it officially. The members of the movement transferred food and humanitarian aid to the combat areas of Donbass and helped usual people to travel to Russia. The torturers tried to force the woman to slander against her fellows, but she turned out to be stubborn and denied everything. By the way, during the whole time she has been detained, she has not been brought to trial. In the end, Elena was exchanged, and the Ukrainian court declared her wanted. As a terrorist. Since then she lives in Donetsk. In a dormitory. She is trying to be active – “organize” people in the same situation, her comrades in misfortune, she joined the local Cossacks. Now the way home is closed for Ms Petruk. Her daughter with her two grandchildren and her daughter-in-law with her three grandchildren stay there. She communicates with her relatives through the phone and via the Internet, using general phrases, so as not to harm them. Because she is declared an enemy on that side. And those whom they declare enemies will not get any mercy. A dormitory in Donetsk, where IDPs from occupied areas of Donbass live. 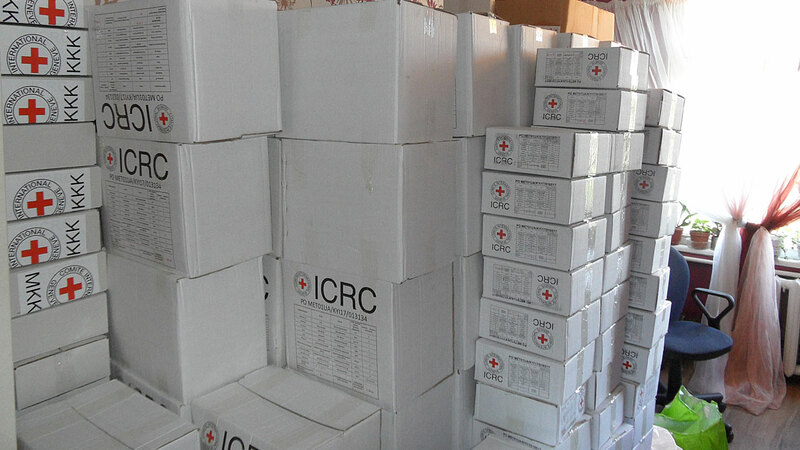 Humanitarian aid in a dormitory supervisor’s room. Larisa thinks it could have been worse. Because many people kidnapped in this way just disappeared without a trace. This is not surprising, however, considering who worked with the «separatists». Larissa was sentenced to eight years. Subsequently, she was exchanged, that is how she was released. But the life of this woman will never be the same. The husband, who had been wounded, became disabled. For a number of reasons, their family life didn’t go very well. The perpetrators did not hurt Katya, her daughter, as it turned out. In her hometown, she found a boyfriend who took her to Kiev. Now she only communicates via mobile phone with her mother, and they do not talk on sensitive topics. Another daughter is in Russia. Only Larisa’s mother stayed in Mironovsky, who, while Larisa was tortured, desperately tried to find her, spending nights near the prison walls. She still comes to visit her daughter. Baytalokha is grateful to the DPR because her treatment was funded by the Republic, including false teeth. Now she works in the utility service office and tries to forget what had happened as if it was a terrible dream. But it is not so easy. Citizens of Pervomaiskoye village, Yasinovataya region, also voted in favour of the DPR. 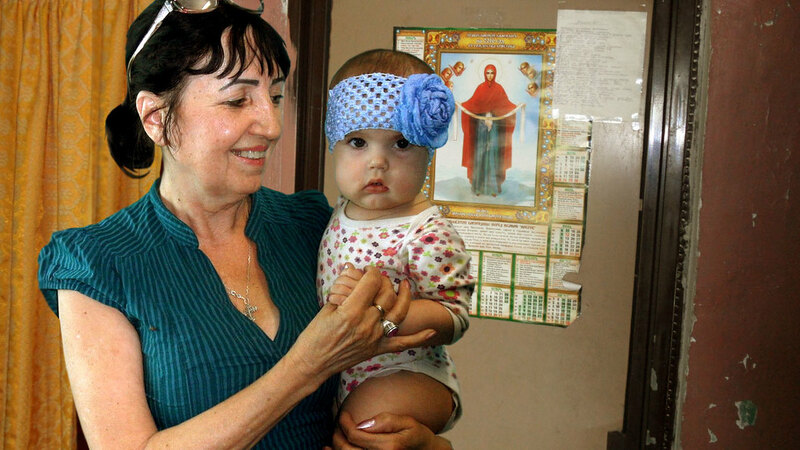 Alexandra Valko, who comes from the Komi Republic, moved to the warm Donbass with her daughter when she was 20 years old, she was a deputy of the village council there. She was well known and appreciated by villagers. The woman was one of the organizers of the referendum of May 11, and when the war broke out, she provided militiamen with food. 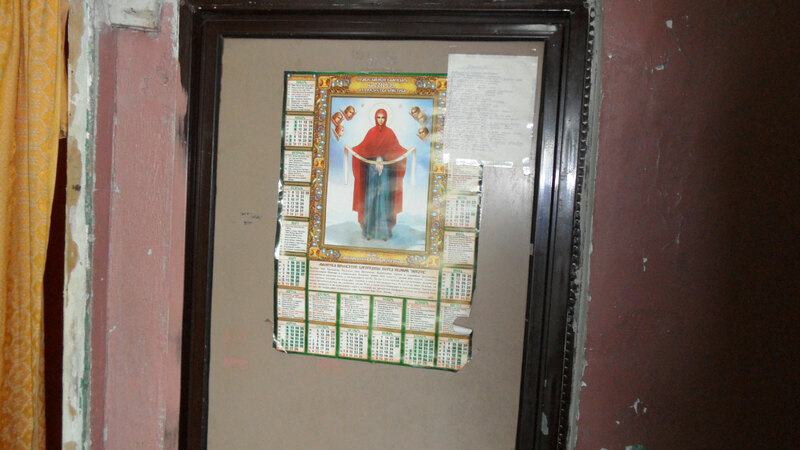 In the summer of 2014, Pervomaiskoye village was seized by the Ukrainian army. And in January 2015, “guests” came to Alexandra – the members of battalions. These two photos were taken within a period of one and a half year, this is Alexandra Valko before and after being a Ukrainian prisoner. 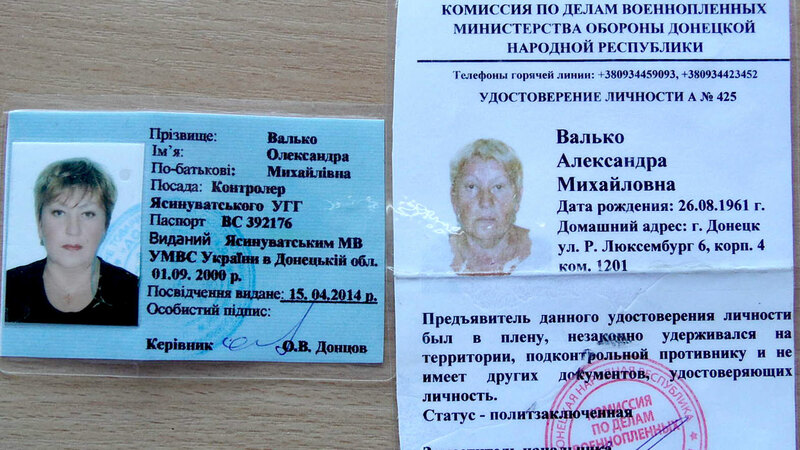 According to Alexandra, the torturers wanted her daughter, the activist of the Donetsk People’s Republic, who backed off along with the militia, to come to her. They called her, they lied that her mother was in a hospital, asked to come and see her. According to the woman, one of the young militants, who came from Chop in Western Ukraine, took pity on her and began to secretly bring her water and salo. After she spent days in that torture chamber, Alexandra was placed in a cold room, which she called a freezer. There, Alexandra stayed for two and a half days. There she noticed some holes on the wall and smeared blood. Then, she was dragged to a gym, where she was handcuffed to a pipe. “There, they did not beat me anymore,” Valko recalls. “Eighteen days have passed, and one soldier told me that the following day I would be taken to court.” I asked for a lawyer previously, but the answer was: “Terrorists are not supposed to have a lawyer.” And I did not give any evidence to them, because they did not ask anything. Then they brought me a large bowl of borshch, two bowls of buckwheat porridge with meat, I could even see pieces of goulash there, a jar of compote, a box of biscuits, a box of dry bread cubes, and they added: “Sorry, there is no bread, you can eat without it.” They put it all neatly on a tabouret, and even put a napkin there. And on February 14, Alexandra was taken to court, as promised. They didn’t let her wash her body after so many days spent in inhuman conditions. 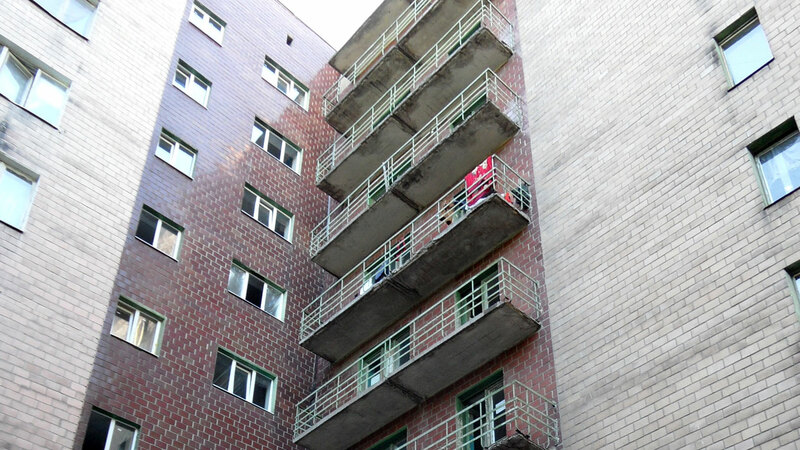 Valko was accommodated in the same dormitory for displaced persons. At first, she could not eat, Alexandra vomited, her jaw was broken. In order not to go insane, she worked in a kitchen, she cooked. 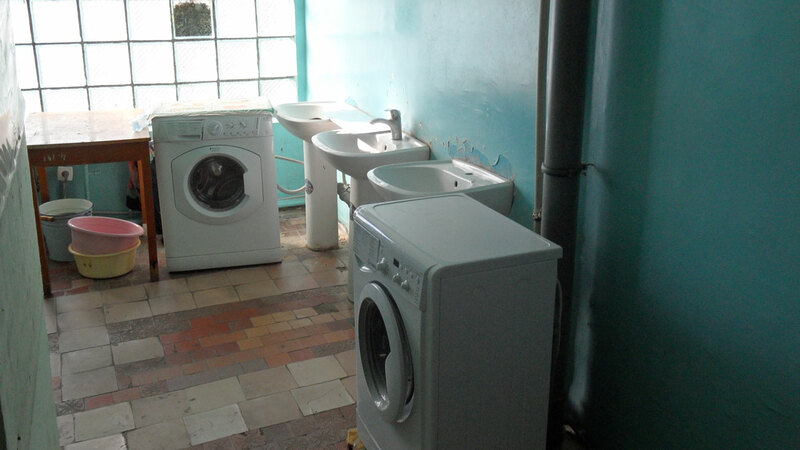 Inside the Donetsk dormitory, where displaced persons from occupied areas of Donbass live. The DPR provided all necessary surgery to her, as well as false teeth. But the other misfortune happened to her – diabetes. And now the woman’s legs darken, gangrene appeared … She gets insulin free-of-charge in the DPR, but other medicines cost a lot, and it is really hard to buy all these – her pension equals two thousand nine hundred rubles. It is hard to believe in the stories of these poor women. It is extremely difficult to accept the fact that such a thing is possible. But it’s true. It’s hard to believe, but it’s true. And those who like to speculate about the return of Donbass to Ukraine, I would like to recommend to look into the eyes of these women.